You will be hard pressed to find inedible food in Italy. Everything I ate was simply delicious, however, there was one particular day where everything I consumed transported me to a place of pure delight. 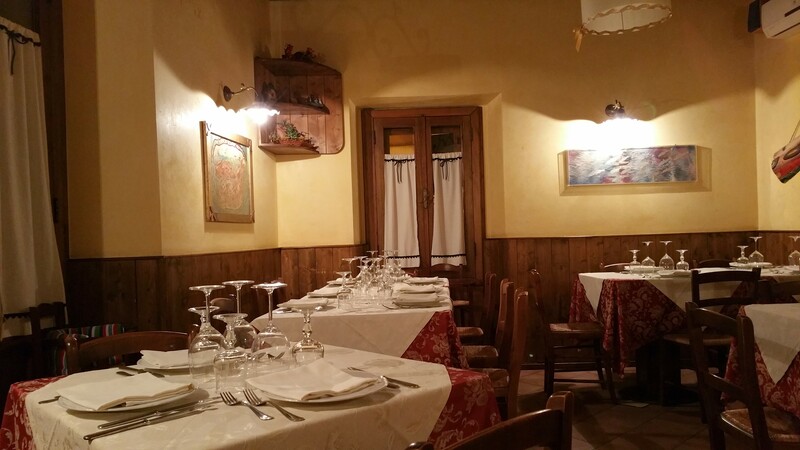 After walking around the old town Barletta, my friend and I decided to enjoy a meal at Oesteria AL Duomo, which was recommended by our tour guide, Dionisio. There are times when following a recommendation from a tour guide is the best thing to do. THIS was that time. After our walk and a stop at a chocolate shop (see below), my friend and I walked by to Al Duomo for dinner. We decided that we would arrive at the restaurant as soon as they opened. When we arrived shortly after 8 pm, it was obvious to our server that we were tourists and that we didn’t speak Italian. To the restaurant staff, we were a unique pair (my friend is Asian and I am African American). This did not detract from the level of service we received; I believe it enhanced it. The interior of the restaurant was warm and inviting. I really enjoyed the fact that we were the only people there for the first 15 minutes. After that two Italian gentlemen, who appeared to be regular visitors to the restaurant arrived. This made me feel like I was experiencing an authentic Italian dinner. The menu was in Italian and we weren’t quite sure what to eat and I believe the server recognized that we didn’t know what to get. He came to us and recommended dishes for us. I am not sure if these dishes were on the menu or if they were so enthralled with having our unique presence in there place and decided to showcase what the types of food that they offer at AL Duomo. Either way, what transpired after putting our fate and appetite in our server hands was simply amazing and transformative. The first dish was a plate of cured fish. 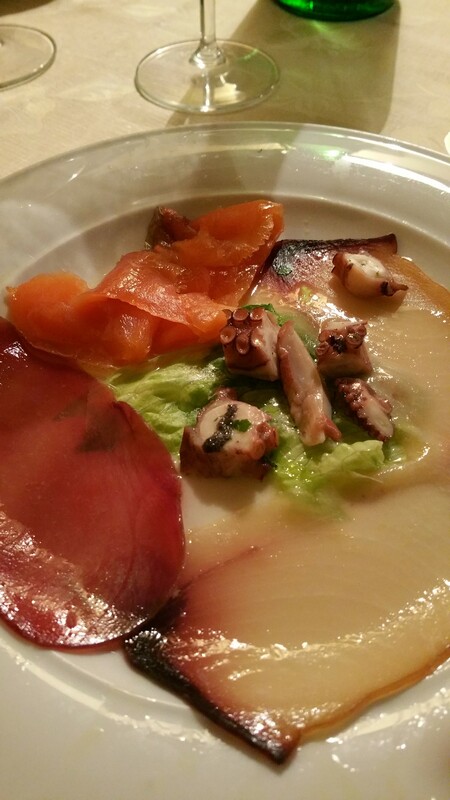 This dish contained salmon, octopus, tuna, and what I believe to be swordfish. I was a little scared at first, but I thought to myself, “What the heck? 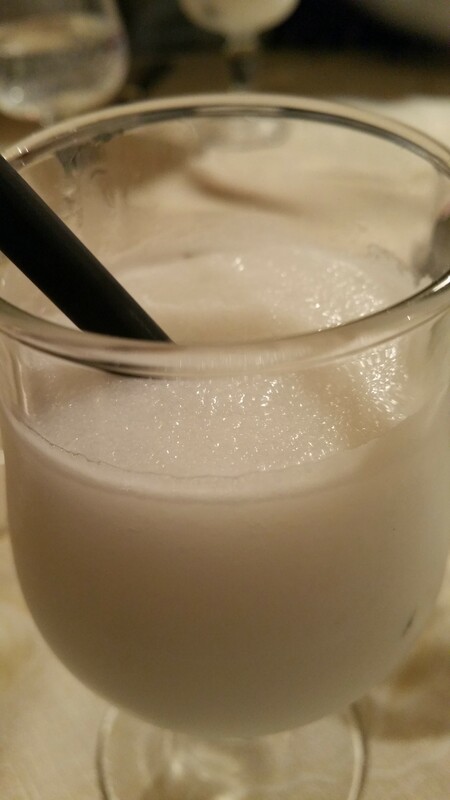 Why not try it?” My taste buds had never been happier. 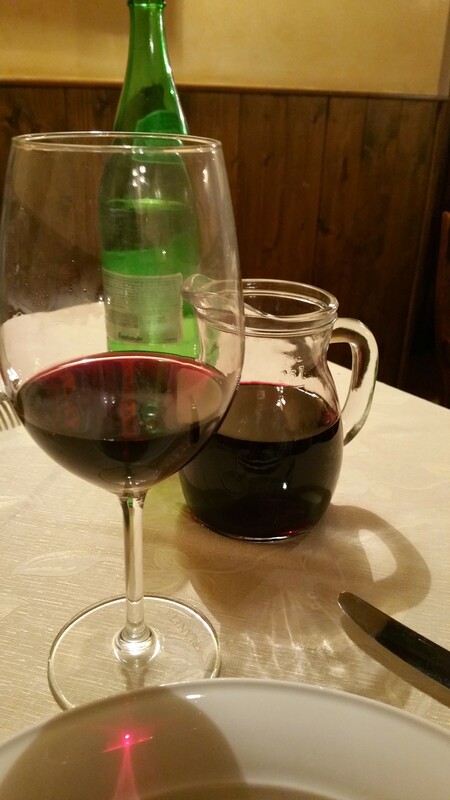 With our dinner, we enjoyed a glass of wine, which was also recommended by our server. It was also very good. The second dish we received was cross between bruschetta and pizza. 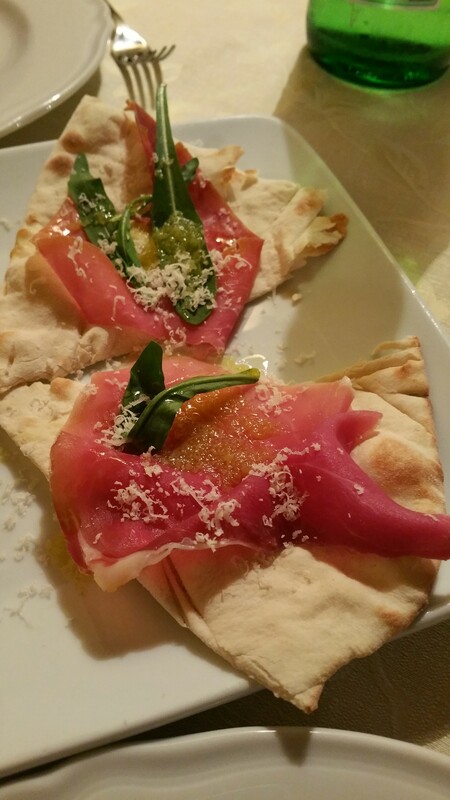 The bread was flat with prosciutto, garlic, basil and olive oil. The prosciutto draped across the bread reminded me of a delicate flower. YUMMERS! 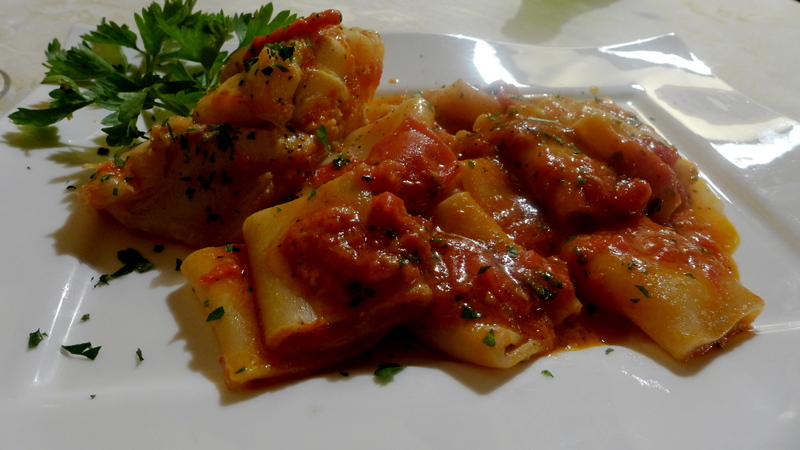 The third course was pappardelle pasta with swordfish in a red sauce. I wish I could find the words to describe how stunningly amazing this was and how much I enjoyed eating it. I am not a lover of seafood, but I wish I could have eaten this for dinner everyday. After the pasta, we were given an aperitivo. This was like a lemon slushy. It was a great palate cleaner. 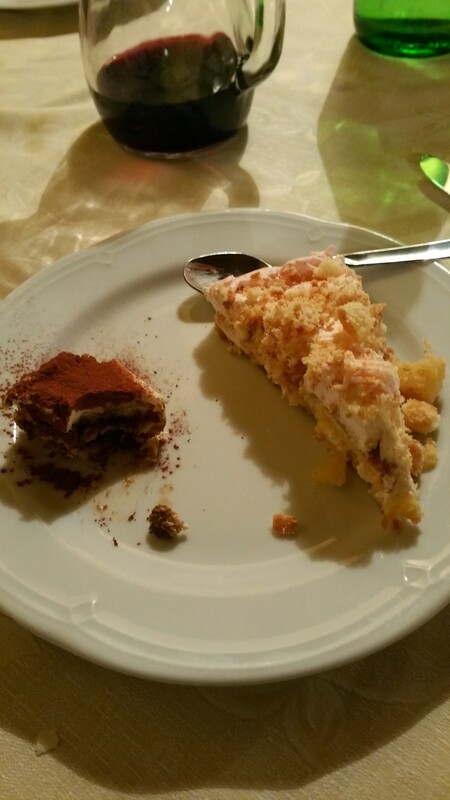 For desert, we had a luscious tiramasu and apple dish. The desert were equally delish, but by this time, I thought I would burst from the amount of food I consumed. We had the best meal and it was only about 40 euros for the both of us. We were surprised at this. As we were leaving, we had the opportunity to meet the restaurant manager and the chef. We managed to have a conversation with my very basic Italian and there very basic English. As we talked, they gave us limoncello, which I tried and loved, and more desert in the form of fudge. By this point, I just couldn’t eat anything else. This day could not have ended better.